Source of title proper: Title based on the contents of the photograph. The slide was donated to the BC Archives in 2018 by Gaylord Villers, the son of the photographer. The item consists of a colour slide taken in July 1957 by Gaylord Villers, Sr. 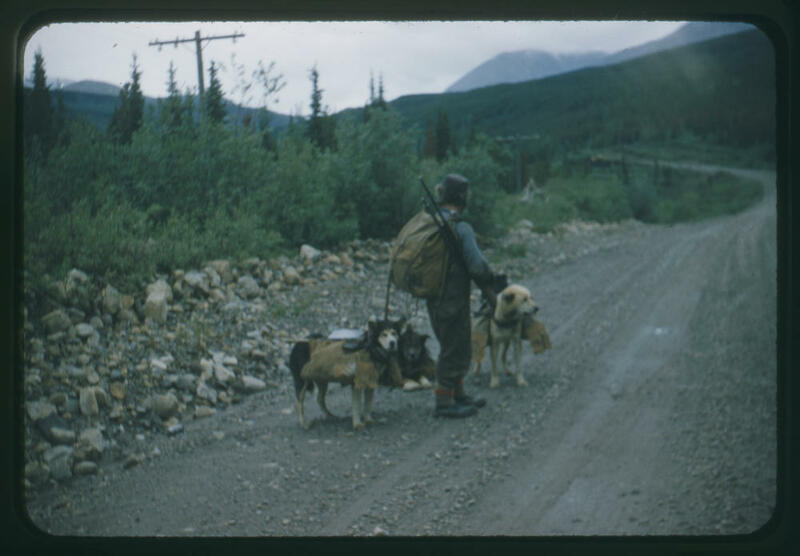 The photograph is of Joe Prokopchuk, better known as Yukon Joe, with his pack dogs. The photograph was taken during a family holiday on the Alaska Highway, where the family encountered Yukon Joe and asked to take his photograph. The original 1957 slide was digitized in 2018. A duplicate slide was created by Villers in 1972. There are no access restrictions. See conservation note. Copyright transferred to BC Archives in 2018 by donor. Original slides and duplicate slides in cold storage and are not accessible. Please consult the digitized version.